Ambarella, Kroger, and Autodesk are all due to report earnings results over the next few trading days. Stocks inched higher last week as investors cheered positive earnings announcements from retailers heading into the holiday season shopping rush. 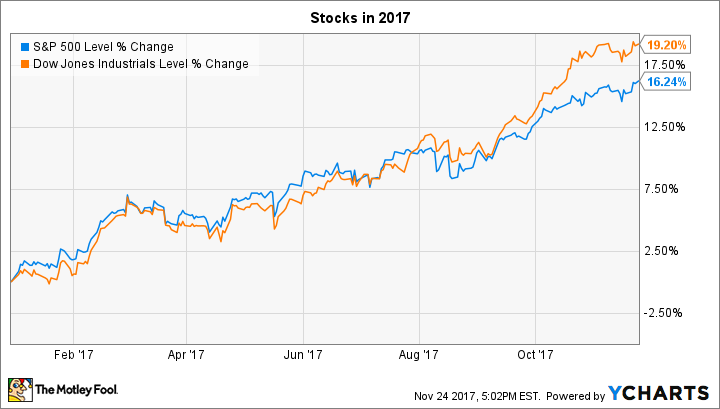 The Dow Jones Industrial Average (DJINDICES:^DJI) and the S&P 500 (SNPINDEX:^GSPC) both reached new highs and are well into double-digit gains for the year. A few of the most anticipated earnings reports due in the week ahead include Autodesk (NASDAQ:ADSK), Ambarella (NASDAQ:AMBA) and Kroger (NYSE:KR). Here's what investors will be looking for in these announcements. Computer-aided design software specialist Autodesk will post its results after the market closes on Tuesday. Shares are trouncing the market this year as the company shows off how a transition to cloud-based delivery can improve its business. Last quarter, for example, Autodesk gained 270,000 new customers in its subscription services, and the boost helped recurring revenue jump 94% to $784 million. Recurring revenue is up to 91% of the sales base today, compared to 69% a year ago. That success has given management plenty of confidence in their 2017 sales forecast. CEO Andrew Anagnost and his team predicted in late August that third-quarter revenue would be between $505 million and $515 million as the company progresses toward its goal of boosting subscription numbers by as much as 675,000 users in fiscal 2018. Investors would be happy to see that subscriber growth since it points to faster and more stable sales gains in the future. Investors haven't been impressed with Ambarella's latest operating trends. The high-definition camera tech specialist is enduring slower sales growth as it deals with a surprising contraction in its drone market and stubbornly weak sports camera sales. Revenue rose by just 10% last quarter as gross profit margin declined. Ambarella executives are predicting lower sales through the rest of the year, but they're encouraged by the long-term bets they're making. The company is introducing the first of what's likely to be many generations of its computer vision semiconductor chips, which should help it target the huge market for assisted driving cameras. In any case, shareholders are likely in for a bumpy ride with this stock since it has a huge range of growth possibilities. Ambarella's sales could take off if its engineers succeed in pushing the camera tech industry further with innovations around image capturing and processing. On the other hand, sales and profits could slump if competitors do a better job at solving camera manufacturers' problems. Three months ago Kroger announced a return to growth after three straight quarters of flat or declining comparable-store sales. The stock was punished anyway, though, as the grocery store chain continued to give up profitability in exchange for slight market-share gains. Net profit margin has dipped to 1.5% of sales through the first half of 2017 from 2.6% in the year-ago period. But CEO Rodney McMullen said management was happy that customer traffic and market share metrics both improved as it sharpened its competitive position against rivals like Wal-Mart Stores. Kroger's latest forecast calls for comparable-store sales to rise by a bit less than 1% over the second half of 2017. It will be interesting to see how that prediction changes this week, especially since Wal-Mart recently posted a healthy 2.3% comps improvement in U.S. stores thanks to a mix of rising traffic, increased average spending per store visit, and soaring e-commerce sales. Kroger will need to log wins on each of these metrics if it's going to extend its 12-year streak of stealing away market share from the industry titan.